Last weekend we flew to Sapporo for the annual snow festival. Sapporo is an interesting city, much quieter than Tokyo. It reminds me of Salt Lake City because it is laid out in a grid with large blocks. The main venue for the matsuri is a park that is one block wide and 13 or 14 blocks long. 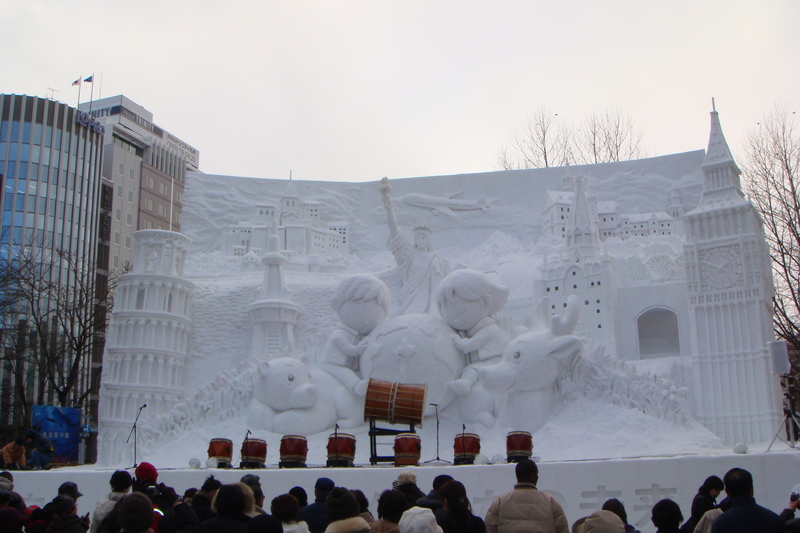 The festival started when some students made snow sculptures one year and it has grown. There is one block where international teams compete. Most of the sculptures were amazing. The one that I like the best was created to promote enviromental awareness. We arrived Thursday afternoon and set out from the hotel immediately. We ran into some of senior missionaries from Tokyo who live in our ward. It was a beautiful, sunny day. We began at block one and were working our way to block six where the food stalls were set up. By the time we got to block six it was a mini blizzard and we were freezing and all the seating in this area was outdoors. I got some noodles and Rick being wiser got a ramen. My hands were frozen by the time I finished and the noodles were cold. I kept looking for a Starbucks so I could get hot chocolate. I only saw one in the entire city and it had been set up for the matsuri in a tent that was packed with customers. So, none of my favorite hot chocolate to warm me up. later that night we went back to look at the ice sculptures. Friday we wandered around a shopping area near our hotel and rode the trolley. When we got on the trolley we noticed two missionaries at the back we visited with them for quite awhile. They said it was really unusual for them to see gaijin (foreign) members on public transportation. Sapporo only has Japanese wards where we have 4 English wards here in Tokyo. We also walked around the fish market, definitely not as big or busy as Tsukiji in Tokyo. 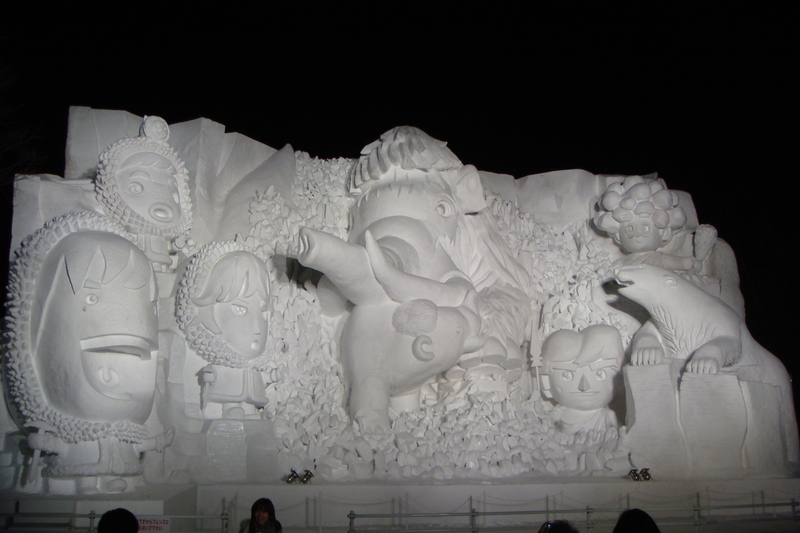 That night we ate Hokkaido Barbeque and went back to see how the snow sculptures looked at night. I like them better at night they are more magical with the lights on them. 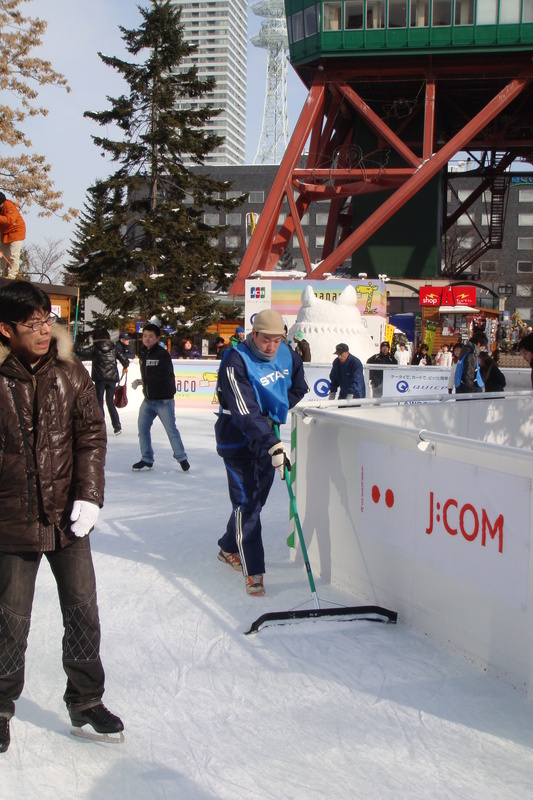 There was also a small ice skating rink which appeared to be free except for the skate rental of 220 yen. It was mostly children with a few parents skating to help out. I liked the zambone Hokkaido style. Those sculptures are amazing! So Papa Ricky did not get out on the rink to show off his awesome ice skating prowess. 🙂 Too bad. So fun to see your adventures and family!